I’ll be honest here, I didn’t really have any expectations for Faith when I picked up the first issue; I knew there was some buzz about it – especially among the Graphic Policy staff – but I never really expected anything more from the series than the seemingly standard high quality Valiant product. Which was delivered, and then some. 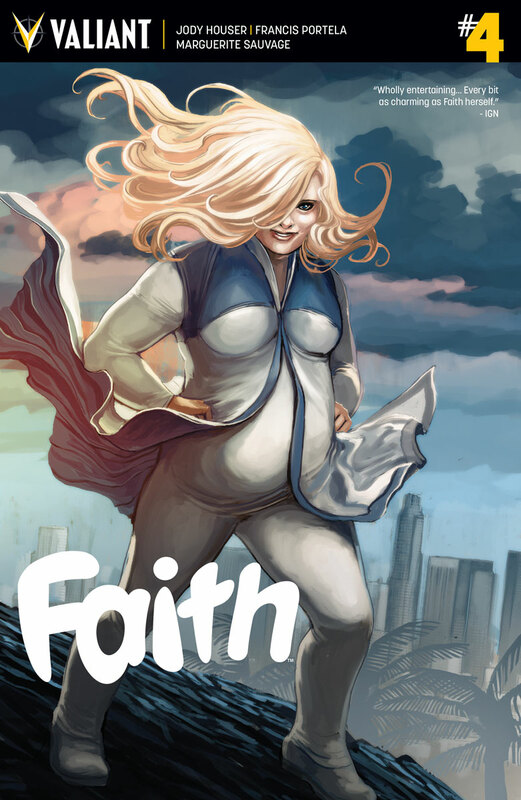 I deliberately went into this series knowing nothing about Faith, not even her code-name Zephyr, because I’d heard Jody Houser on Graphic Policy Radio saying that you don’t need to know anything about her (and that the series won’t spoil Harbinger if you do choose to go back and read that). Did I miss anything not having any prior knowledge of the character? Probably, but it certainly didn’t hamper my enjoyment of this series, which is a testament to Houser‘s writing that she tells us all we need to know about Faith within the first issue or two of this series. The third issue is easily within my top ten list of best comics so far this year (along with a couple other Valiant comics), and while this issue didn’t quite surpass the last, it’s a brilliant end to an amazing series. Faith, as a full package, will be one of the best four issue miniseries you’ll read all year. It will remind you why you love superhero comics. The fourth issue brings a sold conclusion to the plot, with highlights including the inner monologue of Faith as she goes about saving the world/LA/people and testing herself in ways that you may not have really thought a hero would have to think about, again reinforcing why the character is so brilliant – not only does she love being a hero, but she is so very much like all of us. If you can’t find something about Faith to love, then I dare say you’re not looking hard enough. She is one of the most complete characters in comics today. A couple of things that are worth noting; the first has nothing to do with the quality of the comic, is that while this wasn’t quite as good as the last issue I’m still scoring it stupidly high because it’s still a bloody great comic. I just loved Faith #3 that much more than a ten point grading scale allowed me to convey. The second, kind of does have a correlation to the comics quality; I’ve been trying to find these issues at my comic shop with no luck, so I know at this point I’ll be trade waiting (unless I get lucky), because this series has had multiple printings per issue. If you can find a copy, grab it. Grab it and find out why Faith is so amazing.